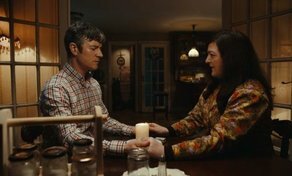 Barry Ward and Maeve Higgins in Extra Ordinary. Following the film’s successful world premiere in Austin, Texas over the weekend, SXSW Film Festival has announced that ‘Extra Ordinary’ has been selected for an additional ‘BUZZ’ screening on Friday, March 15th. Written and directed by Mike Ahern and Enda Loughman, ‘Extra Ordinary’ is the debut feature film from the directing duo, which featured in the Narrative Spotlight section of the film festival. Starring Irish comedian Maeve Higgins (‘Moone Boy’), Barry Ward (‘Taken Down’) and Will Forte (‘Nebraska’), the film also boasts a strong Irish supporting cast of Siobhan McSweeney (‘Derry Girls’), Risteard Cooper (‘Apres Match’), Alison Spittle (‘Nowhere Fast’), Mary McEvoy (‘Glenroe’) and Jamie Beamish (‘Derry Girls’). Filmed on location in Kildare, Tullamore and Wicklow last year, ‘Extra Ordinary’ is produced by Blinder Films’ Katie Holly (‘Love & Friendship’), Yvonne Donohoe (‘Striking Out’), Ailish Bracken (‘The Lodgers’) and Mary McCarthy (‘The Delinquent Season’). The film is made in association with Umedia who also funded the project alongside Screen Ireland and Inevitable Pictures. Wildcard Distribution will handle the film, which is expected to release in Ireland later this year.